Sri Hanuman- the great devotee and servant of Sri Rama is also a supreme strategist a naya pandita. It is to him primarily Sugriva and Vibhishana owe their thrones. Sri Rama's might played only a secondary role. Hanuman and Rama and to a lesser extent Hanuman and Sugriva had an insight into the working of the mind of one another and the convergent thinking that manifested between them decisively shaped the outcome of their endeavours. Hanuman, the most Sagacious, following Valmiki's authentic version, focuses precisely on the skill of Hanuman as a shrewd tactician- as a king maker in modern parlance. Sri K.N. Subramanian came under the spiritual influence of Sadguru Sri Gnanananda Giri Thapovanam in 1955. The Vedantic study and spiritual sadhana pursued by him have led him to strongly believe that Traditional Vedanta alone contains the proper mode of sadhana that leads to perfect realization of the blissful absolute and that Sri Ramayana of Valmiki and Mahabharata of Vyasa contains all the values that we need to make our lives sublime and the social life happy and harmonious. His works on yoga Vasistha and Tripura Rahasyam are in the press. This book is about the extra-ordinary person who has been described by no other than the Adi Kavi as the jewel in the grand necklace of Ramayanam-Ramayana mahamala ratnam. It lists the deeds of extraordinary Hanuman, in the way Valmiki has described, to aid pious contemplation. To contemplate on Hanuman is to imbibe the qualities – intellectual strength, abiding fame, fearlessness, healthiness, agility and skill in speech, as the traditional sloka affirms. The book also project Hanuman in the role of Kingmaker. 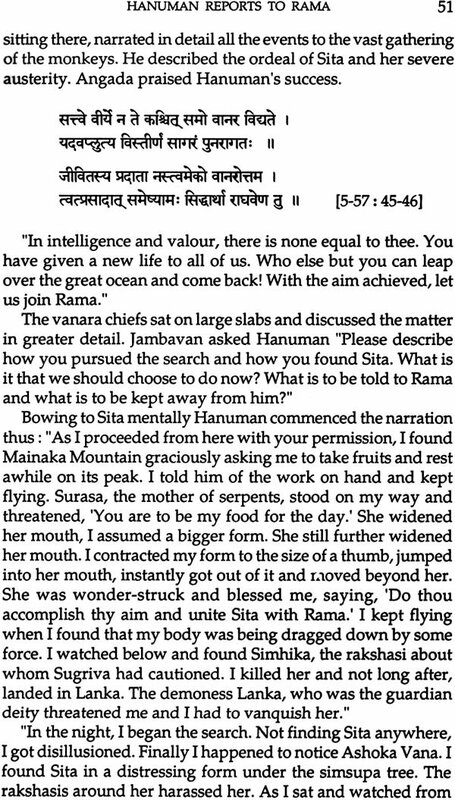 Rama got back Sita and Ayodhya kingdom because of Hanuman, as Rama Himself affirmed. Hanuman enabled Sugriva to become the unquestioned king of Kishkinda by effectively making it impossible for Angada to revolt against Sugriva and in the case of Vibhishana, it was Hanuman who carefully sowed the seed of desire for kingship in the heart of the rakshasa and prepared for his alignment with Rama, eventually leading to his coronation as the king of Lanka. How far the work succeeds in achieving its second aim is for the readers to decide. Inasmuch as Brahma has told Valmiki, “In regard to the story of Rama, whatever has happened will become known to you. No utterance in the composition of yours will prove false.” Valmiki’s Ramayana alone is relied upon for the study of Hanuman in this work. Whatever merits the other Ramayanas have from the literary or the devotional angle, they cannot dilute the authenticity of Valmiki’s version and any purposeful character evaluation has to be solely based on Valmiki’s version of the story. I express my sincere gratitude to Dr. K. Venkatasubramanian, who is a great scholar and a distinguished administrator for kindly agreeing to give a foreword. A number of friends have gone through the manuscript and suggested corrections and I am grateful to them all. I think the publisher Sri Jandhyala L. Sharma for having sponsored the publication of this work on behalf of his family’s Jagadamba Trust. I had the privilege of going through the wonderful publication “Hanuman, the Most Sagacious (Buddhimatam Varistah) by my scholarly friend Shri K. N. Subramanian. I had known Sri K. N. Subramanian for long and he is a man of erudition and intellect. When he writes about the “Most Sagacious,” his words acquire wings. The book deals with the extraordinary personage of Shri Hanuman who is considered to be the brightest jewel adorning Ramayana. Shri Anjaneya’s intellect, absolute fearlessness, quick agility, endearing skills in speech, all these make Him the real master of Ramayana. In an outstanding speech, the late Prof. K.R. Srinivasa Iyengar the noted intellectual, once spoke in Pondicherry University where I was the Vice Chancellor that Ramayana is after all the story of Sita and it should be called “Sitayana.” His remarkable treatise on Sitayana was a mighty example of Prof. Srinivasa Iyengar’s devotion. On the occasion of writing this foreword I recall Prof. Iyengar’s speech when he said also that Ramayana could also be called “Hanumayana,” as it was Sri Hanuman who made things happen in this story of Sri Rama and but for Hanuman the divine events could not have taken place at all. There is a school of thought, which believes that Shri Hanuman who was the flag mast of Arjuna’s Chariot driven by Lord Krishna was the personality who dictated the Gita. This is a debatable point but the most sagacious intellectual could have done it also under the Lord’s initiative. Shri K. N. Subramanian the author also projects Sri Hanuman as a supreme kingmaker. Sugriva’s fate was ordained by Hanuman. Based on the Valmiki Ramayana, the author known for his piety and sincere dedicated has dealt with deep devotion about Sri Sundara, another name for the great Hanuman. The Sundara Kanda is the Kanda devoted to Sundara. Beginning with the Dhyana Slokas of Shri Anjaneya the book launches Hanuman from his birth. The early childhood exploits like his attempt to swallow the Sun and Rahu clearly indicate the supreme valour and strength of the Vayu Putra. Various grand exploits of the great Anjaneya have been traced by the author with relevant quotations and this makes the book really a scholarly one. Among other things the book portraits beautifully the meeting between Sita and Hanuman. 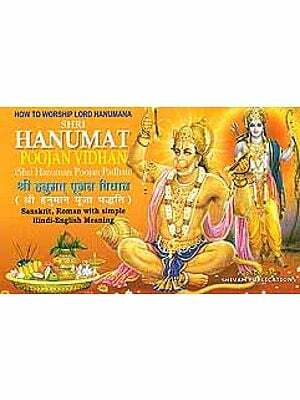 Hanuman shines throughout the book as an unparalleled devotee of Lord Rama. Rishi Valmiki had painted Anjaneya as an ideal man (Vanara) of action and this is echoed in this outstanding book too. Sri Hanuman had always been a man of action and whatever problem he had faced, he solved it immediately by his strength of the brain and the brawn. Shri K. N. Subramanian has done yeoman service to the devotees of Sri Hanuman in writing this book, which, I am sure, will find its place in all the libraries of the country. In these days of intellectual stagnation, when we have to fear about everything, it is time we worship the great Hanuman. He is perhaps the only solace to us. When we read about Sri Hanuman we are drawn to him and he is sure to stand by us and give us the necessary strength, valour and courage to meet the tense situations. “Sapta Sarga Parayana” of Sundara Kanda is often considered to be a very effective prayer. If the Parayanam is conducted for 68 days, it is most beneficial and wards off all evil. I am happy that the author has included Sapta Sarga Parayana Chart along with the book. Let us pray to the Supreme Lord of action and great intellectual Sri Hanuman to Save us all and to heights. As a believer of Sri Anjaneya for a long time I have felt His Efficacy and I do feel this remarkable publication of Sri K. N. Subramanian is a real addition to Divine treasures.